Despite the prohibitive legal climate for sports betting in India, its citizens love to place bets on their favorite games. It is estimated that over $60 billion has been wagered on sports betting in the country, with a sizable percentage of that being wagered on overseas sports betting sites. In most of India, laws regarding gambling and sports betting are stuck in the 19th century. While the legal climate is slowly changing, many have to turn to placing bets online. 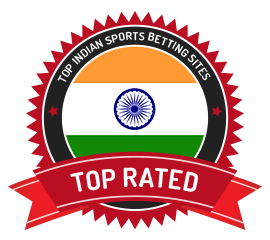 On this page you will learn more about the legal climate of sports betting in India, the most popular sports to bet on and how to deposit on sports betting sites. Analysts estimate that over RS3-4 billion is bet on sports online each year and that number is steadily growing. That’s not surprising considering that over 400 million people in India watch sports every year. India’s sport of choice is cricket. The first cricket match was reportedly played in 1721, and for nearly 300 years, citizens of India have enjoyed a love affair with the sport. Of course, there are plenty of other games to bet on in India, including football, basketball, badminton and many more. Sportsbooks allow you to make a wide variety of bets. Many players prefer to bet on single games that provide favorable odds. The real gamblers might place a few bets on a long shot in hopes of scoring a massive payday. Sites also offer live sports betting, meaning you can make bets while the games are underway. Anyone can bet on sports online. Sites are designed to be welcoming to new and experienced players alike. Most have tutorials that can help you become familiar with betting. Always bet responsibly and only gamble for fun with money you can afford to lose. When signing up for online sportsbooks, make sure to take advantage of promotional offers. The most common are welcome bonuses which provide a deposit match, typically 100 percent. Some sites also offer free bets which give you additional free chances to win. Details of promotional offers can be found in the promotions section of the online sportsbook. Sports betting in India is mainly illegal except for betting on horse races. India’s Supreme Court has ruled horse racing a game of skill and therefore legal. However, all other sports betting is based on the laws of the individual states or the general laws of India. Most of India is subject to the Public Gambling Act of 1867 and the Technology Act of 2000. Under those laws, sports betting is not permitted. However, individual states have the right to make their own gambling laws. The only state that has online gambling laws that favor sports betting is Sikkim. In 2009, it passed legislation that allows online sports betting provided that the state licenses the sportsbook. However, it is widely known that India’s government is not actively looking to prosecute online gambling sites or any citizens who choose to play on the sites. What are Popular Sports to Bet on In India? India has a love affair with cricket that is unmatched by any other nation. Betting on the Indian Premier League outpaces all other betting on major sportsbooks serving India. After cricket, football is the second most popular sport with a ton of action on international games, including the English Premier League. Other popular sports to bet on in India include badminton, tennis, basketball and international sports leagues such as Aussie Rules football, the NBA, NFL and more. Bettors can place bets on anything from individual games and tournaments to individual bets such as how many goals the Indian national team will score during the 2019 AFC Asian Cup. Yes, according to Section 115BB of the Income Tax Act, any form of gambling winnings is subject to a 30 percent tax rate. Also, there’s additional education and higher-education tax placed on the taxable money won, making the total tax rate 30.90 percent. This law likely pertains to online sports betting despite the fact that it is outlawed in most states in India. Note that we are not tax accountants or lawyers, so you should defer to your local tax accountant or lawyer for more information regarding online sports betting earnings. Depending on which site you play, you may have to take a few extra steps to fund your online sports betting account. Most sportsbooks accept credit card payments, typically Visa and MasterCard. However, many Indian bettors are discovering that many deposits using credit cards are failing. As an alternative, we recommend using one of several popular e-wallets to fund your sports betting account. Skrill and Neteller are among the most popular e-wallets in the world. You can send money to your Skrill or Neteller account from your bank account and then use your e-wallet to make your deposit. Other popular options in India are PayPal and ecoPayz. Note that in some cases you may be forced to exchange rupees to another currency. If so, you may incur currency conversion fees. However, many sites will allow you to deposit and place bets using rupees. When it is time to cash out from your preferred site, most will require that you use the same account that you deposited with. If that is not possible, then the site will offer other alternatives. Check the site’s cashier to learn more. Deposits using e-wallets are instantaneous. When cashing out, you may have to wait 24 to 48 hours for processing provided you have verified your identity information. After processing, most payments will transmit within 24 hours. If you want to place bets on your mobile phone or tablet, the majority of online sports betting sites serving India will allow you to do so. In some cases, you may be forced to download a dedicated mobile app for your smartphone or tablet. If that’s the case, you will either be presented with a download link for the site or redirected to download the app from the Apple Store or Google Play. Many sports betting sites will allow you to play directly from your mobile web browser. Many places are abandoning mobile apps and flash-driven content and upgrading to HTML5. Sites that are completely mobile-optimized will have all the same features as the desktop website, meaning you can make a deposit and place the same bets as if you’re on your desktop or laptop computer.